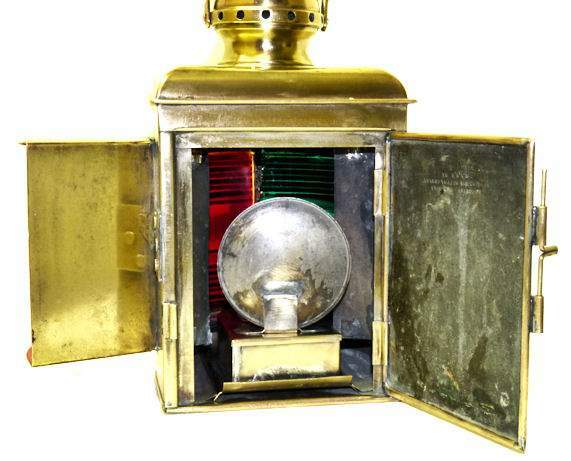 PRESENTED is one of the rarest marine lights Perkins Marine Lamp Corporation of Brooklyn, NY made for boats up to 26 feet long. It is only the second example that we have had to offer. Anthony Hobson's, "Lanterns That Lit Our World Book Two", Gold Hill Press, 2004 shows them on page 88. 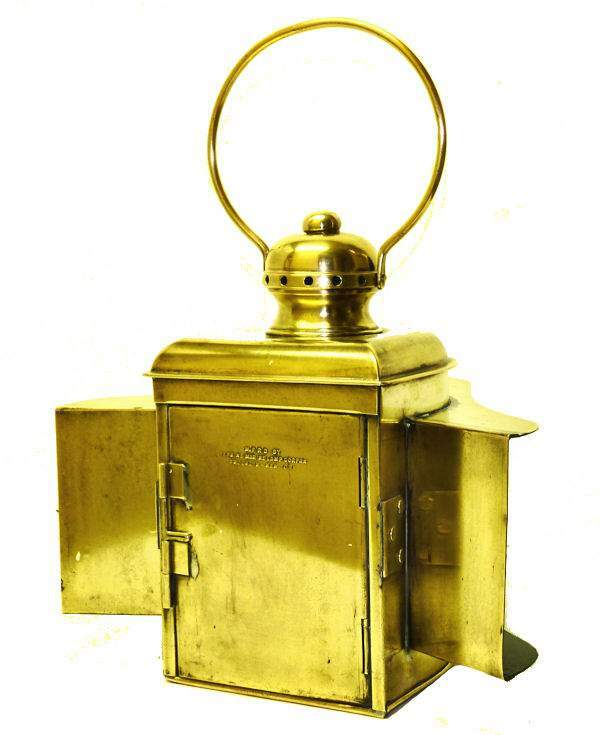 He says the Vogel “Durable“ lamp was picked-up by Perkins, and that after 1916, Perkins manufactured and sold it as their “Wonder“ lamp, Hobson classifies it as “Very Rare“. Starting in 1904, Perko made all kinds of lights under their original name, "Persky". 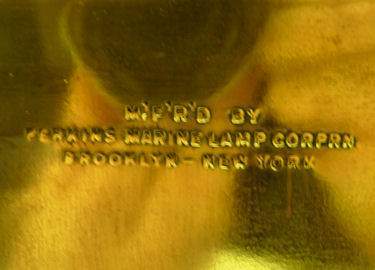 In 1916, they incorporated under the name Perkins Marine Lamp Corporation in Brooklyn, NY. In 1931 the name was changed to Perkins Marine Lamp & Hardware Corporation. In 1961, the Brooklyn facilities were closed and operations were moved to Miami, FL. Perkins was dropped from the name and the company became known as PERKO Inc. It was in 1916 that the Perko trademark was registered, and it has been used ever since. The company still makes high quality marine lights and hardware out of its Miami, FL facilities. If you like polished copper, set off by red and green paint, you have to love these lights since nothing else will compare to their Turn of 20th Century styling. The bail adds 4" Weight 5 lbs 1 oz. CONDITION: This remarkably attractive light is in generally good condition overall considering its age and use. There are only a couple of minor bends, dents and marks of age. However, at the very top a small finial is missing and the reflector is missing from the burner. There is an old hole that was drilled in the top. The lenses are perfect. The original kerosene burner is included. International buyers welcome, but inquire first. We have satisfied customers in Argentina, Australia, Austria, Belgium, Bermuda, British Virgin Islands, Canada, Chile, China, Czech Republic, Democratic Republic of Congo, Denmark, Estonia, England, France, Germany, Greece, Holland, Hong Kong, Hungary, Iceland, Indonesia, Ireland, Israel, Italy, Japan, Kuwait, Latvia, Luxembourg, Malaysia, Martinique, Mexico, New Zealand, Nigeria, Norway, Nova Scotia, Panama, Poland, Portugal, Puerto Rico, Romania, Russia, Saudi Arabia, Scotland, Singapore, Spain, St. Maarten, Sweden, Switzerland, Thailand, Turkey, United Arab Emirates, USVI and the Eastern Caribbean. This Perkins Lamp predates the PERKO Mark. It is very scarce and should appeal to the most discriminating collector who is prepared to pay an appropriate price. This Fine Old Lamp Has Been Sold. Thank you! 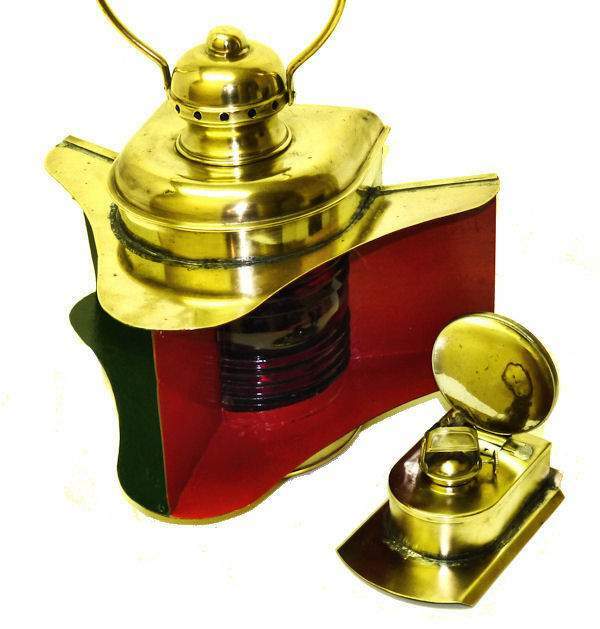 PRESENTED is what we know to be one of the rarest marine lights Perkins Marine Lamp Corporation of Brooklyn, NY made for boats up to 26 feet long. They are recorded in Anthony Hobson's, "Lanterns That Lit Our World Book Two", Gold Hill Press, 2004. On page 88, he identifies the Vogel “Durable“ lamp saying that after 1916 Perkins manufactured and sold it as their “Wonder“ lamp, and classifies it as “Very Rare“. Turn of 20th Century styling. DIMENSIONS: Not counting bail, 11" H x 9" H x 9" D x 12" W.
The bail adds 6" Weight 4 lbs 14 oz. CONDITION: These remarkably attractive lights, are in outstanding condition overall considering their age and use. There are only a couple of minor dents and marks of age. The lenses are perfect. The original kerosene burner is included..